Investors may want to expand their horizons by looking for solid buying opportunities outside America's borders. A strong dollar has hammered the profitability of many multinational companies in the past 18 months. That's not something that any single company can control, but it can lead to artificially lower stock prices for solid companies that may list "foreign exchange rates" as one of their biggest headwinds. That could provide buying opportunities for foreign stocks that may otherwise go unnoticed. If you're looking for international investments to buy in 2017, then consider taking a closer look at Braskem (NYSE: BAK), Veolia Environnement (NASDAQOTH: VEOEY), and Total SA (NYSE: TOT). Just before the Summer Olympics this past August, I singled out Brazil's leading chemical manufacturer as my top stock to buy. At the time it was beaten down by Brazil's epic recession, political turmoil, and related bribery scandal that centered heavily on the company's two largest shareholders, Petrobras and Odebrecht. But the stock was obviously undervalued. Revenue was growing and debt was falling. Braskem even sported a better debt rating than its parent country. The stock gradually began to recover. Then December 2016 happened. That's when the company settled corruption charges with U.S. and Brazilian authorities, although Odebrecht was charged with a bulk of the $2.5 billion fine. Investors were fearing much worse, so the news promptly sent shares higher. Much higher. 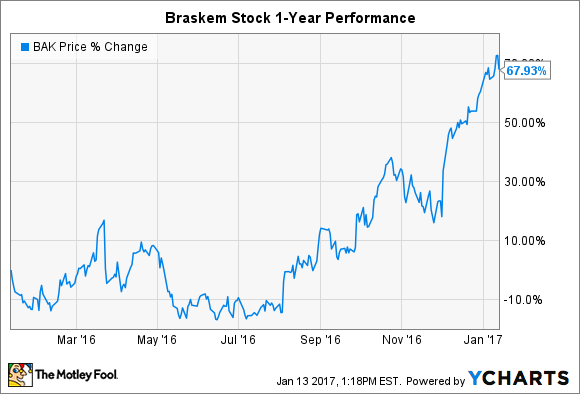 Even with a 67% gain in the last year, Braskem remains one of the top foreign stocks to buy in 2017. Why? Management took Brazil's historic recession as a wakeup call to lessen its leverage and improve its cash hoard. However, it did so without compromising growth investments or profits, as evidenced by 182% growth in net profit from 2014 to 2015 -- the height of the recession. Some of its growth investments aim to fundamentally change chemical production. That includes a novel process for converting sugarcane ethanol into higher value chemicals such as polyethylene, which is traditionally sourced from more expensive and non-renewable fossil fuels, and an industrial biotech process for turning sugarcane into natural and synthetic rubber. If oil prices continue to recover in 2017, then that should help lift average selling prices across the company's portfolio. If you're going to invest in Brazil, then Braskem could be your best bet. Veolia Environnement has expanded its global footprint in recent years by courting municipalities and commercial operations looking to outsource water treatment solutions. That means foreign exchange rates have ensnared that company's operational performance, too, and investors reacted strongly to the company's most recent quarterly earnings and guidance released in early November. Revenue will fail to grow in 2016 compared to 2015. That alone sent shares on a downward spiral, which have resulted in the stock losing nearly one-third of its value in the last year. There is reason for optimism, however. 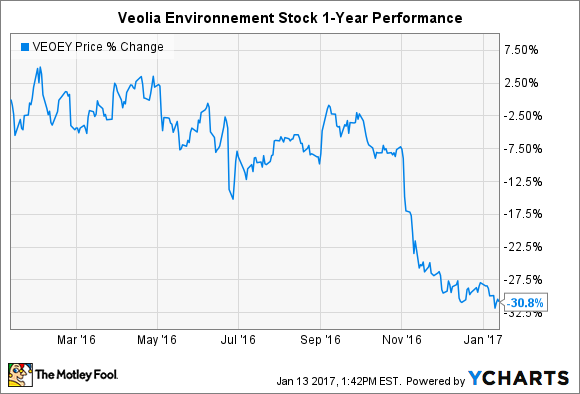 Veolia Environnement has managed to blunt the damage from global headwinds while protecting margins and profits. Management has a plan to grow revenue over 8% by 2018 while improving net income and free cash flow before dividends by 33% and 53%, respectively. If that occurs, then the stock should easily regain the 30% it has given up since November. There are several favorable catalysts on the horizon that bode well for management's chances to make good on its promise. An aging American infrastructure provides a wide open playground for Veolia Environnement to court municipal customers -- something it has done with relative success in the last five years. If federal spending in the United States is set aside for major, once-in-a-lifetime investments, then the company could be one of the biggest near-term winners. Additionally, rising oil prices could mean more projects in the long term, as evidenced by a recently closed $3.6 billion industrial wastewater order from Sinopec in China. Therefore, the 8% growth target by 2018 seems pretty realistic, and maybe even an underestimate. Total SA is also a French company, but it just so happens to be one of the largest oil companies in the world. In summer 2014 the stock quickly ascended to highs not seen since the great energy run-up in 2007 and 2008, but then, as investors now know, the floor fell through for oil prices. The stock has been in a funk ever since, although recent developments in global markets have lifted it recently. Once again, there is reason for optimism. The obvious catalyst is rising oil prices. 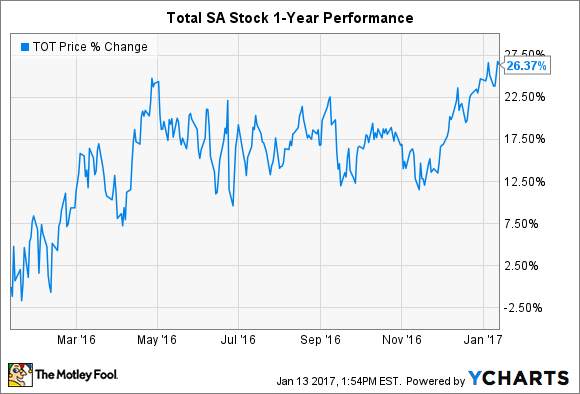 That would be a big help for Total SA, which saw revenue for the first nine months of 2016 slip 16% from the same period of 2015. Cash flow from operations decreased 37% in the same comparable periods, while most other financial categories also declined. Management has a history of not making kneejerk reactions and patiently executing on its long-term vision. Sometimes, the ultra-long-term. Total SA owns a significant share of solar leader SunPower and has made strategic investments in renewable chemical manufacturing, including a portfolio of technologies that could one day produce drop-in jet fuel from agricultural wastes. Of course, movements in the oil market will continue to make or break the stock, and conditions appear more favorable heading into the first quarter 2017. It can be easy to overlook foreign stocks when looking for new investment opportunities. Research can be complicated by the need to translate press releases or the difficulty in finding financial information from traditional sources such as the SEC. However, if investors know where to look and what to look for, then they can find solid companies others have overlooked. I think Braskem, Veolia Environnement, and Total SA fit the bill.